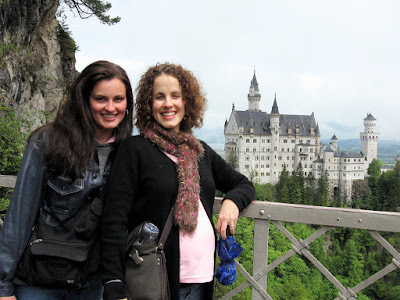 This is a picture of my good friend Kameron and I on a fantastic trip to Europe a couple of years ago. We traveled with our choir, and Kameron worked for the company that arranged the trip, so she did a lot of the planning for this trip, and many others (and went on the trip 7 month pregnant!). She recently decided to branch out on her own and is planning choral tours at her new business, Noteable Travel. Okay, Noteable ? Travel (yes, it’s spelled that way intentionally. Hence the little notes in the middle.) is a company which organizes ad hoc LDS choir tours for adults. There will be one itinerary each year, with either one or two groups participating. “We” is me and my mom. She has the business side of things more than covered, and I have the music/travel side down, thanks to my jobs over the past 8 years. So we’ll have a guest director for each group – someone people know and respect.Our 2009 tour is to Ireland, and will happen in July of 2009. So if you are a singer who loves to travel, get over there fast. The deadline to register for the Ireland trip is Dec. 14. Wouldn’t that be an exciting stocking stuffer!?! The other person I love and admire is my baby sister, Shanda. She has had two beautiful homebirthing experiences and was invaluable in helping me out when I had my daughter a little more than a year ago. Her positive experiences motivated her to become certified as a HypnoBirthing Childbirth Educator. She is going to begin offering classes in January in Colorado Springs, Co.
Go check out her website that I designed for her. And if you know of anyone in the Colorado Springs area who is expecting, send them her way! 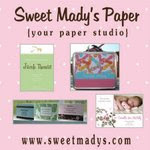 And since this is already a commercial, I want to thank Michelle @ Sweet Mady’s Paper for becoming my first official sponsor. Check out her cute, cute, store! I love the lunch boxes! I am still accepting advertising. Go here for more information! And while we are talking business, I just realized that I got an award a while back and never posted about it. Heidi @ Blue Eyed Blessings gave me this Butterfly award! Thank you very much! (And since I am so behind on blogging, I am going to continue putting off handing out awards, at least until the new year). I have been working on something for you all, but am having a heck of a time getting it finished. Hopefully it will be up soon, so check back! I’ll have to check these out:-) Great photo of you and your friend. What an amazing trip! How nice are you??! And you even put me before Shanda?? Shanda, don’t be mad. Ü Thanks for clarifying that I was 7 months pregnant – I appreciate it. As soon as I read the word “picture”, I thought – wow, am I going to have to clarify that I was really pregnant??? I do like that picture. Thanks for the plug!! My hubby is a band director so we always use a similar company. Where is she located? I’m so excited, because I’m going on my stepdaughter’s trip to NYC soon with her choir class. FUN FUN FUN! !